Anyone who's watched Martin Scorsese's Taxi Driver surely remembers, or has remained haunted by, many images from the film, most of which — if not all— began as humble pencil drawings. Like many major motion pictures, Taxi Driver began not just as a script but also as a storyboard, the piece of comic book-like sequential art filmmakers use to plan shots, camera movements, and character placements. Some directors, like Ridley Scott, spend time crafting detailed storyboards, while others, like the thoroughly improvisational Werner Herzog, don't use them at all. Scorsese falls somewhere in between, sketching out storyboard panels that feel more like brief notes to himself and his closest collaborators. You can see them alongside the Taxi Driver scenes they produced in the video above. "Storyboards express what I want to communicate," Scorsese told Phaidon in 2011 for an article on the exhibition "Between Film and Art: Storyboards from Hitchcock to Spielberg." "They show how I would imagine a scene and how it should move to the next." And the effect on his process of using as seemingly flimsy a tool as a pencil? "The pencil line leaves little impression on the paper, so if the storyboard is photocopied it loses something. I refer back to my original drawings in order for me to conjure up the idea I had when I saw the pencil line made." Every filmmaker has their own way of doing things, and as you can see when the video lines up these pencil drawings with (millions of dollars later) the finished sequences, Scorsese's method gets results. "These storyboards are not the only means of communication for what I imagine," the director adds at the article's end, "but they are the point where I begin." This is tremendous! I’d love to watch more films with the storyboards side-by-side like this. Thanks for sharing!. t the genius of the movie was born out of these intricate sketches on his storyboard…amazing ! I agree! 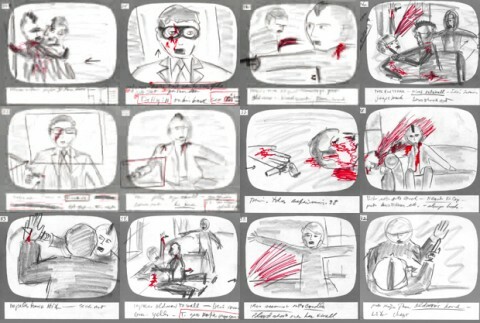 Great storyboards-and I’ve always loved his filmwork.